There are plenty of myths and stories about the behavioural traits of pitbulls, which means that some dog owners may be put off from bringing a pitbull puppy into the household. 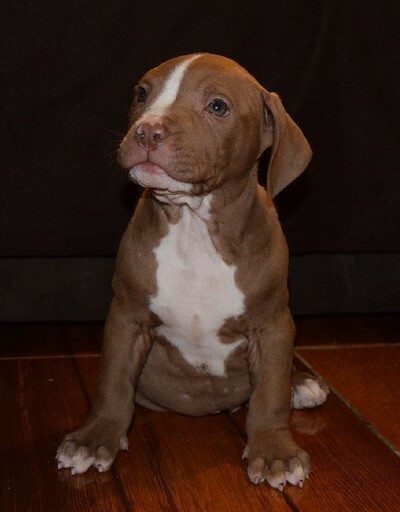 In this introductory guide to how to raise a pitbull puppy, we aim to look at the issues of aggression and basic training to show that you can train your new pup to be good natured with the right approach. Dealing with the problem of aggression. The biggest concern for many dog owners that take on a cute pitbull puppy is that they will grow up to be tough, destructive monsters with the attitude problems of their ancestors. It can be difficult to fight this if the puppy has been the subject of bad breeding, but one from healthy stock can been trained to become a loving, sociable and good-natured dog. Tests on breed temperament have shown that the breed can actually be one of the most loving and tolerant breeds, but owners have to put the work in. This means training from an early age, the right care and attention and neutering males to avoid the risk of aggression as they mature. Aggression comes in two form, both of which can be easily managed. The primary concern here is that a pitbull will work on some innate drive to harm, or even kill other animals. So what happens when you take them to the dog park or if you have other animals in the house? The key here is socialisation from an early age. Gradually ensure that your puppy gets used to interacting with other dogs and people, either by talking them to the park or having dogs and relatives visit the house. It is important that this is carried out in a controlled environment with the eventual goal of being able to let a dog off a leash and see them play with others in a calm, friendly manner. Doing this on a leash to start with is a must because you can easy reign them in and correct their behaviour if they get too aggressive. This is also a big concern for many new owners, especially if they have children in the household. The ongoing image problem and media coverage of pit bull attacks means that this breed is singled out as one that can kill or maim. The truth, however, is that it will only do so if it is mistreated and not trained to respond well to human interaction. Pitbulls are born to please their master; give them the right tasks and the right encouragement and this can lead to a great relationship. Again, socialisation plays an important role here. 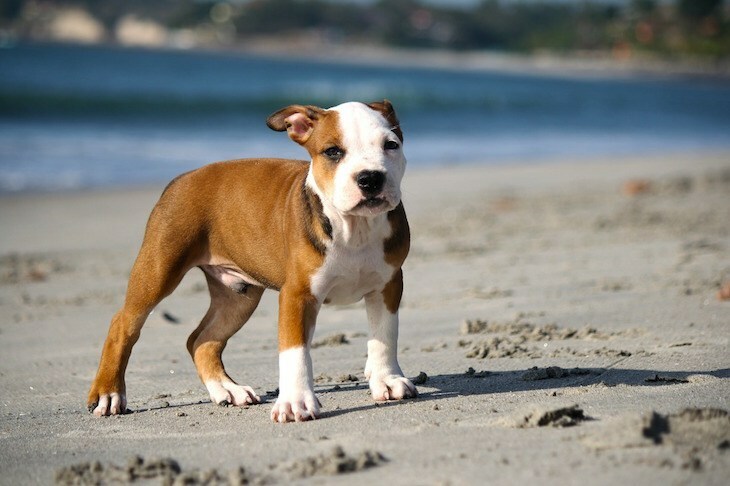 Pit bull puppies will bite and nip in play, but it is possible to train them out of this behaviour by showing them the consequences of the negative action and rewarding them for gentle play. This is a clever, high energy breed that requires a lot of effort and stimulation. Attention and mental stimulation is important in order to ensure that energetic play and a happy temperament do not boil over into hyperactivity, or disruptive behaviour that can lead to harm or damage. Give them plenty of exercise and stimulate their brains with food puzzles, but also train them to understand that a calm, sociable dog gets the most attention and the best treats. This is particularly useful in households where the pitbull is part of a pack. They need to fit in with the behaviour of the other dogs and can’t be singled out with extra attention. Other important considerations when training a pitbull puppy. As with any puppy, you need to also consider basic behaviour training, house training and training for other traits desirable in dogs. House training needs the same level of commitment and patience with pitbulls as with other breeds, but their intelligence means that they will soon get the right idea with encouragement and a regular routine. Teaching other basic commands from an early age is also a great idea as it can reinforce that bond and master/dog relationship that this breed craves. A pitbull pup that knows how to sit and return is much easier to train in those socialisation exercises. Here you can read about 5 essential commands for your puppy. How to raise a pitbull puppy. As you can see, pitbull puppy training takes a lot of time and effort if you want to be sure of encouraging all the right traits in your dog, but the rewards are worth it. Fears about aggression and pack mentality can be put to one side if you work with your pup from an early age. Focus on basic commands, the pet/master relationship and socialisation and you have a great chance of training a sweet, loving pitbull. Make sure to have some dog food treats when you train your puppy. Here you can read about the best dog food for pitbulls.